Passengers hanging out at Munich Airport in Germany can now hang 10 as well. Free surfing, with complimentary loaner surfboards and wetsuits, is available through Aug. 24 in a giant standing wave pool set up outdoors between Terminals 1 and 2. Pre-registered guests can surf 10 at a time for 45-minute sessions. Twice a day, a bar will be placed across the water so beginners can hold on. Non-surfers can watch the action between flights from the poolside grandstand or from a temporary beach, which has palm trees, lounge chairs and a cocktail bar. This is the fourth year surfing has been an option at the Munich Airport Center, a public space that also hosts an annual beach volleyball tournament and a Christmas Market. 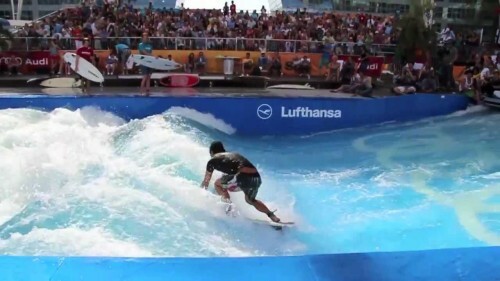 The surf’s definitely up at Munich Airport this summer. The 3rd European Standing Wave Championship is going on this weekend in a giant wave pool installed between two runways at Munich Airport, with surfers competing for 10,000 euros in prize money. The competition is part of the “Surf & Style powered by Lufthansa” event running through August 25 and anyone can stop by and go surfing from 10 am until 8pm. There’s even a free surfing time each day starting at 3 pm (reservations required). For those who have finished surfing or who just want to hang out by the water, there’s a beach area with palm trees, lounge chairs and a cocktail bar. There’s another way to surf for free at Munich Airport: on the internet. In the past, 30 free Wi-Fi minutes were only accessible to those who opened a browser, put in a mobile phone number and waited for a text message with a log-in code. Now you just need to launch a browser and plug in an email address to get on-line.